Low Level Laser Therapy (LLLT) is a laser or LED light therapy that improves tissue repair (skin wounds, muscle, tendon, bone, nerves), reduces inflammation and reduces pain wherever the beam is applied. At Torbay Chiropractic Clinic we are fortunate to be able to offer this fantastic form of treatment. 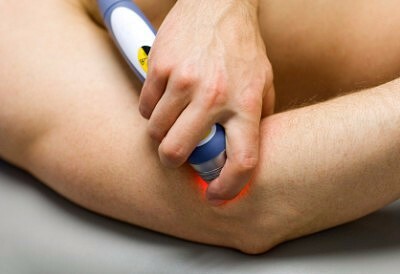 Low Level Laser Therapy and is currently used on a regular bases by our chartered physiotherapist, Kevin Matthews. Kevin has been using Low Level Laser Therapy as one of his treatments for over 10 years not only here with in the clinic environment but also at The 2012 Olympic Games, The 2014 Commonwealth Games and for local professional sports teams. What can Low Level Laser Therapy be a treatment for? Laser therapy delivers pain-relief and addresses the inflammation in arthritic conditions. Rheumatoid arthritis. Laser therapy influences small joints directly and large joints indirectly. It strengthens the antiphlogistic processes and depresses the autoimmune response. The effects in the early stages of the condition can be impressive, but with chronic conditions, although pain is eased on treatment, longer treatment courses measured in months are necessary in order to make a substantive differences to the condition. It has been reported that 6 months can be a turning point. It also appears that adding laser therapy to prescribed medication gives improved results over medication alone. Gout. Gout attacks can be curtailed and the symptoms reduced. 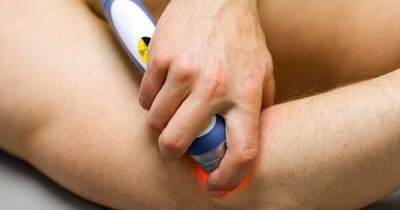 Laser therapy inhibits inflammation, eases pain, reduces swelling and joint tenderness. Osteoarthritis. In cases of osteoarthritis, laser therapy may slow down the degenerative process as well as ease acute symptoms. In the case of large joints such as the hip joint, the therapeutic effects of laser are brought on by an improvement and strengthening of the surrounding tissues. Laser therapy activates the microcirculation and the metabolism, prevents oedema and triggers anti-inflammatory processes in the synovial membrane. Achilles Tendonitis, Plantar Fasciitis and other joint tendons. Laser therapy is widely used to treat various types of tendonitis, both with direct application and by the use of trigger point stimulation. Infra-red laser is generally used and the depth of the tendon beneath the skin dictates the dosage and the area of inflammation the number of points to be treated at each session. Whether tennis elbow or golf elbow, laser treatment is applicable with beneficial effects. In the acute stages, laser relieves pain, reduces swelling and activates tissue generation as part of optimising the healing process. With some chronic cases laser therapy is able to restart this healing process to bring to resolution, but in cases where this is not possible it can be used on an ongoing basis to manage inflammation and pain and used in a preventative manner. Recommended treatment for acute cases would involve direct lasering of the affected area plus any associated trigger points every 2 – 3 days for around 3 weeks. Carpel Tunnel Syndrome and other Neuralgic pain. Laser therapy can be highly effective for carpel tunnel syndrome, when correctly diagnosed. In such a compression neuralgia, low level laser acts by reducing oedema and reducing or eliminating pain. If treated early, complete remission of symptoms can be achieved with laser alone. For more long-standing conditions it is most useful as a complementary measure. If surgery has been undertaken, then laser therapy’s ability to promote wound-healing and again address pain both through nociceptor suppression and endorphin release, make it an ideal therapy for optimal post-operative recovery. Although each case will differ depending on the individual and the stage of the condition, in general treatment every 3 or 4 days would be advised to a total of approximately 10 sessions. A brief background on Low Level Laser Therapy. Dr Endre Mester, a Professor of Surgery at Semmelweiss Hospital, Budapest is often referred to as the grandfather of Low Level Laser Therapy. He discovered that irradiation of tissue with low dose levels using a ruby laser (emitting red light) resulted in an increased rate of healing and his subsequent work provided the initial volume of evidence for the efficacy of laser in healing and wound care. The new science of Low Level Laser therapy (LLLT), also known as Low Intensity Laser Therapy (LILT), was born. Research has clearly demonstrated effects at cellular level, in animals and from clinical experience, but work continues into understanding exactly how laser therapy works. The key research questions today are not whether low level lasers have positive effects, but how the precise and multiple biological mechanisms combine to create the physiological effects and how best to achieve the particular effects sought in each of the wide range of relevant applications. In the meantime LLLT is now widely used by healthcare professionals across the world who appreciate not only its effectiveness but its added advantages of being drug-free, pain-free, non-invasive and without unpleasant side effects. It is often less expensive than alternative treatments and has fewer contraindications than popular forms of electrotherapy, such as ultrasound. Low level laser therapy optimises the speed of repair in acute injuries but will also stimulate the body’s repair processes in cases of non-healing or chronic conditions. Although Low Level Laser Therapy can be used in many different disciplines here at The Torbay Chiropractic clinics we use it for Physiotherapy. Where it’s Optimising soft tissue repair and providing pain relief, laser therapy is a well-used modality for those disciplines focused on physical therapy. Both acute and chronic conditions can be treated successfully. Low Level Laser can work synergistically with manipulation and has fewer contraindications than ultrasound therapy – with LLLT the clinician can treat over plates, pins and patients with pacemakers. Therapeutic lasers are also effectively used on trigger points in musculoskeletal treatments and can provide drug-free pain relief, being of particular aid in the treatment of arthritic conditions and neuralgic pain. Healed tissue which has been treated with laser has been shown to have improved quality and tensile strength, thus minimising adhesions and scarring. Even pre-existing scar tissue has shown improvement after laser treatment. To book an appointment with us, please our friendly reception team on (Torbay) 01803 329799 or (Teignmouth) 01626 7744222.